With a Final Tier 4 diesel engine, the Z997R provides customers with a large zero-turn mower in all conditions. John Deere recently announced a new Z997R Diesel ZTrak Mower that will offer commercial landscapers a powerful zero-turn solution to minimize downtime, decrease operating costs and improve performance. The Z997R will be available for purchase in spring 2015, featuring a powerful 37.4 hp. This mower will be equipped with a Final Tier 4 diesel engine to provide customers with a large zero-turn mower in all conditions, including tall and wet grass. The Z997R is available with a 60-inch or 72-inch 7-Iron PRO side discharge deck, an industry exclusive 60-inch 7-Iron PRO Mulch On Demand deck, or a 60-inch 7-gauge fabricated rear discharge deck. Nick Minas, product manager at John Deere Commercial Mowing said, "The new Z997R offers landscape contractors a powerful zero-turn option that will maximize acres mowed per hour, without skimping on operator comfort and cut quality. The Z997R excels in the toughest mowing conditions while providing the fuel economy and durability commercial landscape contractors value." The Z997R is designed with a heavy-duty frame and includes a shaft drive to minimize deck belt costs and flat-free front tires to reduce field downtime. Additionally, a new electrically powered 14-bushel hard shell dump-from-seat Material Collection System allows the operator to accumulate material with minimized leakage and extends intervals between emptying. The electrically powered dump-from-seat feature lessens the effort required from the operator, providing a trouble-free solution that reduces the time spent dumping. The model also provides a variety of options to improve operator comfort reduce fatigue. It comes standard with a comfort and convenience package; incorporating a power deck lift, ergonomically angle padded handgrips and button-in-hand PTO cutoff. A fully adjustable suspension seat is also available for added comfort. 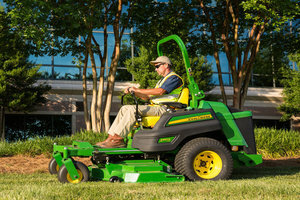 Those attending the 2014 GIE+EXPO will have a chance to see the Z997R Diesel Mower for themselves, along with the rest of John Deere's line of commercial mowing equipment, at booth 1110.